Derma roller is used for a wide range of skin improvements and the needles come in different lengths for your preferred treatments. 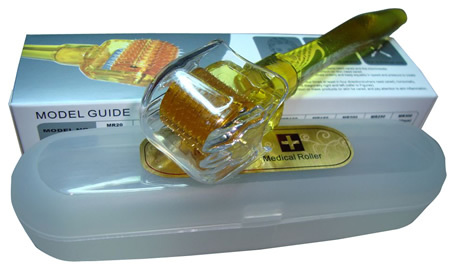 Please choose which size needle roller is suitable for you according to its purpose of treatment before use. 0.5mm - 1.0mm Reduction or removal of mild acne scars, mild chicken pox scars, mild surgical scars and mild ice pick scars. Reduction or removal of Stretch Marks and Cellulite. Anti ageing treatments with improvements to mild wrinkles, mild sun-damaged skin, tightens and lifts facial skin tissues and increases collagen and elasticity for skin rejuvenation. Increased penetration of skin care products in to the skin for added improvements. Improves uneven skin coloration hyper-pigmentation treatment and uneven skin texture. 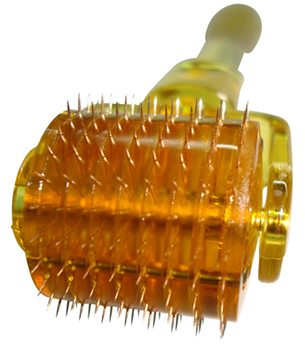 Hair loss treatment with improvement to hair restoration as the roller increases blood circulation to the follicles. 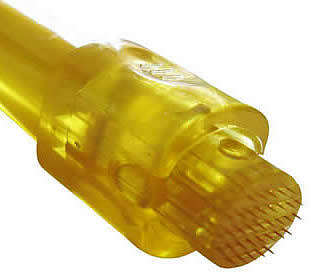 1.5mm - 2.0mm These sizes do all of the above and are used for deeper acne scars, chicken pox scars, ice pick scars, severe cellulite, Deep pitted surgical scars and severe stretch marks. Also extensive hair loss. This quality derma roller can be used on face, neck, body and is cost-effective compared to conventional treatments like laser resurfacing, and has the same skin benefits as lasers without the down time. This is because the derma roller does not affect the whole skin at once as laser resurfacing does, this way healthy skin is left for faster healing. 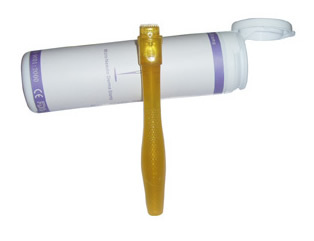 This derma roller can puncture more than 250,000 micro vessels on the epidermal within five minutes. This forms an efficient nutrient delivery system in the epidermis and subcutaneous tissue, and by doing so increases serum absorption and the production of collagen and elasticity by as much as 1,000 percent with no noticeable damage to the skin after treatment and no negative side-effects.
" 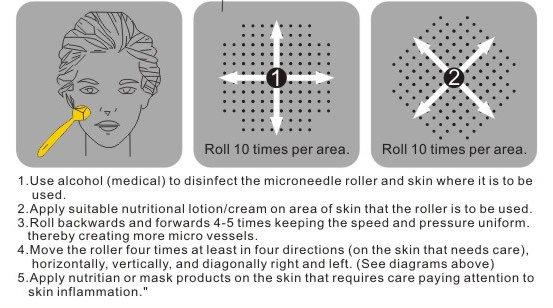 Dermaroller reviews link "